The new V__matrix is a software-defined IP core routing and processing platform. At the 2017 IBC Show, Lawo will unveil its latest solutions for IP transport, software-defined processing, orchestration and seamless control of network resources, and automated workflows. The company will demonstrate a unified infrastructure for audio, video, data and control in practical applications. Lawo’s Seamless Orchestration & Unification Layer (vsmSOUL) gets its European debut at IBC. It’s an overarching service for IP-based production environments that manages the generation and routing of audio and video streams in any multi-vendor IP setup. vsmSOUL is aware of, and handles, information from all system components, and is compatible across individual interfaces and technical solutions. It provides a single point of control for any network size and topology, and provides central stream routing and resource management across single-switch, spine-leaf, or mesh network infrastructures. The mc²96 audio mixing console has been designed to provide optimal performance in IP video production environments through native support for all relevant standards. The mc²96, Lawo’s new flagship audio mixing console has been designed to provide optimal performance in IP video production environments through native support for all relevant standards – SMPTE 2110, AES67, RAVENNA and DANTE. The console features as a world’s first LiveView video thumbnails. Designed for networking in complex IP production infrastructures, the Lawo mc²96 employs Lawo’s unique IP-Share Network Gain Compensation. Reflecting today’s requirements for 3D/immersive audio productions, the mc²96 provides not only tools for surround sound mixing, but also a dedicated elevation controller as standard. In addition, the mc²96 offers Lawo-grade integrated Loudness Metering with full loudness control in accordance with ITU 1770 (EBU/R128 or ATSC/A85). Addressing live broadcast and performing arts applications, the mc²96 offers many mix-assist systems enabling the sound engineer to concentrate on the overall balance and sound quality of the production. 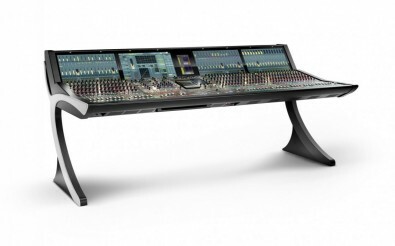 In addition to Lawo’s Audio-follow-Video functionality, the desk’s automated mixing capabilities include an Automix function that automatically adjusts the Ievels of active and inactive microphones, while maintaining a constant, natural-sounding ambient Ievel. The console also features Lawo’s AMBIT Upmix function, which guarantees perfect conversion of stereo signals for amazingly authentic surround sound and supports KICK 2.0, Lawo’s automated close-ball mixing solution for sports such as football, hockey and basketball.